Legion may propose to be focused on the threat of the Burning Legion, but there are darker portents to be found, if one listens carefully. We’ve already discussed the whispers of Il’gynoth in the Emerald Nightmare raid – but there are others as well. 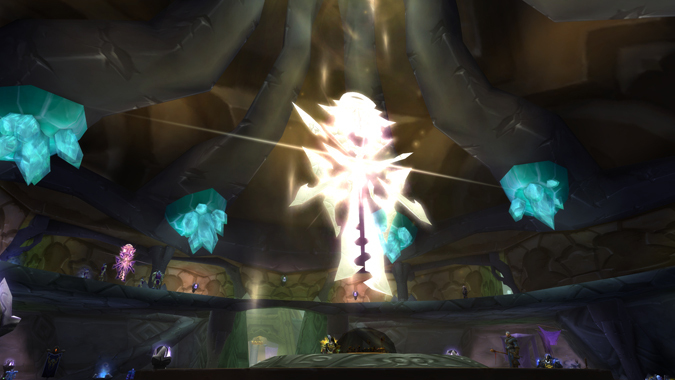 Shadow Priests have one of the most fascinating Artifact weapons this expansion in Xal’atath, Blade of the Black Empire. And although we’re told not to listen to the lies the blade has to tell, one has to wonder…are they really lies? Or are there truths about the universe that we still haven’t completely uncovered? Today’s Know Your Lore is a Tinfoil Hat edition. The following contains some speculation based on known material. These speculations are merely theories and shouldn’t be taken as fact or official lore. 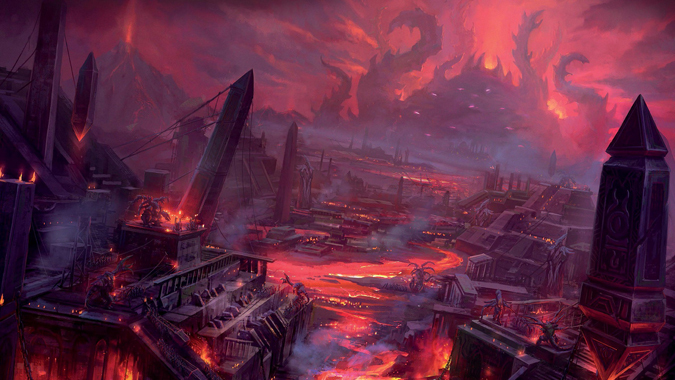 Xal’atath’s origins are never really fully explained, even in Artifact Research. There are, however, plenty of rumors surrounding the weapon. Some say it’s the remains of a forgotten Old God, others say it’s a claw of Y’shaarj. While neither of these theories have been confirmed, we do know that the blade dates back to the Black Empire, when the Old Gods were at the height of their power. And although the Old Gods were eventually chained up and locked away, Xal’atath managed to escape that fate. It changed hands many times over the next several thousand years, but two wielders were of particular note. Modgud, the wife of Sorcerer-Thane Thaurissan, was in possession of the blade during the War of the Three Hammers. She used Xal’atath to unleash the darkness that still haunts Grim Batol to this day – a corruption we witnessed during Cataclysm. After Modgud’s death, the blade eventually made its way to the hands of Natalie Seline. Fascinated by the whispers of the weapon, Natalie began to study and learn from it, eventually learning how to wield shadow magic during the Second War. She taught these arts to others, but was eventually murdered by those same students, possibly at the behest of Xal’atath itself. What Natalie learned was that there was a counterpoint to the Light that she’d studied and mastered. There was more to the world than the Light – there was also the Void. In actuality, this expands to a cosmic scale – in the beginning of the cosmos, there was only the Light. But as some of its energies faded and dimmed they created pockets of nothingness. From the absence of Light, the Void came to be. Obviously, the two clashed. And every time they clashed, they created a series of unstable energies and explosions, from which the universe itself was created. The point where the energies were most unstable eventually formed into the astral dimension we call the Twisting Nether. In a way, you could say that we would not be here without the Void – nor would we be here without the Light. Where the Light works within the scope of positive emotion, the Void does the opposite. You see evidence of this with the Sha, who embody and are drawn forth by displays of various negative emotions. The Sha originated from an Old God, the Old Gods were created by the Void Lords, and the Void Lords are essentially monstrous entities composed of nothing but pure shadow – from the Void itself. The Void Lords created the Old Gods in order to find and corrupt a world-soul. By doing so, they hoped to create a creature so dark, so powerful that not even the Pantheon could hope to stand against it. The Light, on the other hand, existed before the Void came to be. The very essence of creation itself, the Light is a source of hope, comfort, inspiration, healing – positive energy, essentially. But Light isn’t a stationary thing. It ebbs and flows – that’s what created the Void in the first place. And we can see direct evidence of this with the naaru. This cycle of balance, of Light and Void, is an inevitable part of the life cycle of the naaru. D’ore says as much in Auchindoun: “Regrettably, there is nothing that can be done to stop this cycle. 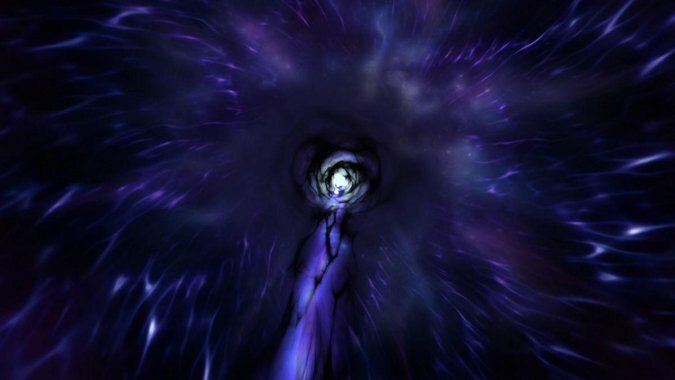 It is a facet of the naaru condition – without the void, the Light cannot exist.” What we didn’t understand at the time was that the reverse was also applicable, here. In fact, the reverse was more truthful. Without the Light, the Void would never have come to be. It’s a constant in the universe. Light cannot exist by itself – eventually, it’s going to fade. And when it does, the Void is reborn. This is the essence of the universe’s existence. It’s a fundamental truth that we haven’t really confronted yet. 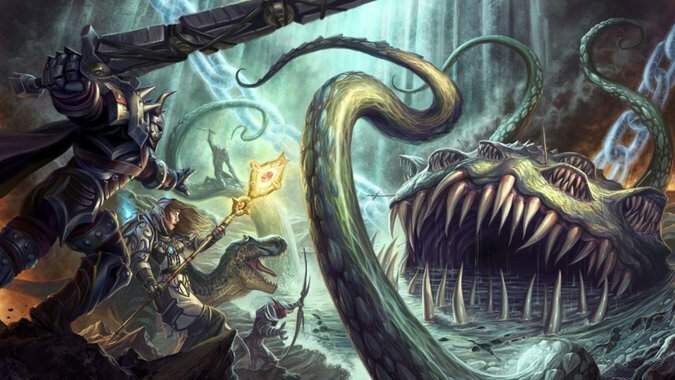 But it certainly gives new meaning to the idea that we can’t kill the Old Gods, doesn’t it? Here’s the interesting part – the Titans aren’t actually warriors of the Light. They’re made up of the primordial matter from which the universe was born. The universe was born because of that chaotic conflict between Light and Void. Logically speaking, this would suggest that the Titans themselves are part Light, part Void. And while they naturally cleaved towards the ways of the Light, they were not infallible. Sargeras is a direct example of that. Once he was confronted with the existence of the Void, it was far too easy for him to fall to the very corruption he feared. Certainly Sargeras thinks what he’s doing is right. Wiping the universe of all life would definitely keep the Void from coming into any more power than it had already attained. So who has the right of it? 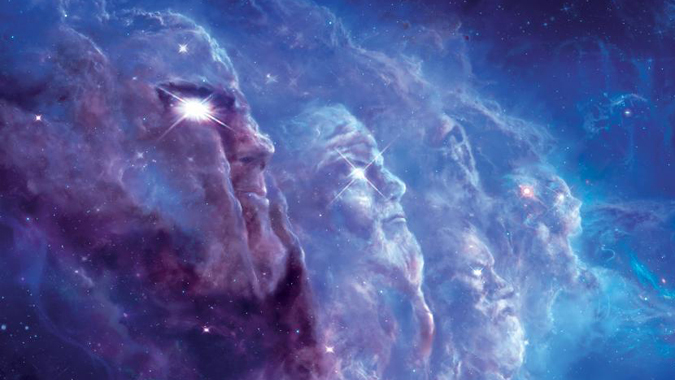 The Titans, who were simply working to put order to the universe and seek out others of their kind? The Light, an inexhaustible source of positivity and creation? Or the Void, which seeks to corrupt and hold dominion over the universe – and even over the Light itself? It’s a complicated question. Here’s what we do know: the Light and the Void are irrevocably tied together. But we definitely don’t have all the details, and Xal’atath says as much to the one who wields it. “The research into the Void here is commendable, but ultimately futile. 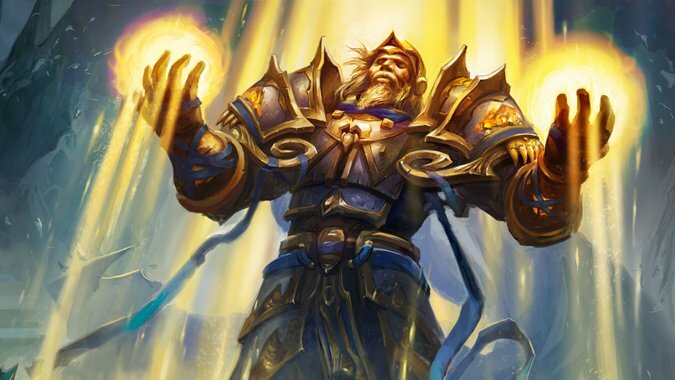 How could you possibly understand what the titans did not?” The implication here is that even Sargeras in all his agonizing, in his fall to corruption, didn’t understand exactly what he was fighting against. And maybe we don’t. But Xal’atath has something more fascinating to consider. Brethern. The implication here is that the naaru and the Old Gods are related. In a way, they most certainly are – the naaru are ethereal bastions of the Light, the ebb of Light is what created the Void. But I have to wonder if this is implying a much more direct relation, just due to the phrasing of that particular whisper. Consider this: D’ore had it backwards. D’ore said “without the void, the Light cannot exist.” But what we’ve been told in Chronicle is that the opposite is true – without the Light, the Void would not have come to be. We’ve assumed, rightfully, that the naaru are creations of the Light. We’ve even been told that Elune had something to do with the creation of the naaru. But how did Elune create the naaru? We know how Elune operates; we’ve seen it in action. The kaldorei were supposedly created by Elune – from Dark Trolls. Elune doesn’t just manifest creatures from nothing, all evidence points to the fact that Elune essentially makes creatures evolve into something more. If Elune is a creature of the Light, this makes sense – the Light is the essence of living energy, after all. The Light transforms creatures in ways we still don’t comprehend. 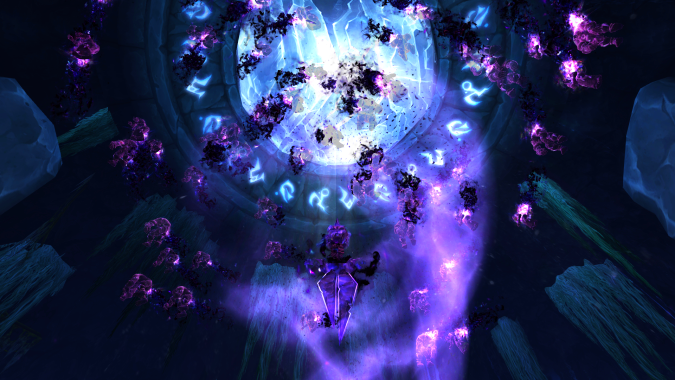 Xal’atath says that the naaru “lost the true path.” So one has to ask – what were the naaru, before their transformation? Are they in fact brethren of the Old Gods? Were they purified and transformed by the Light? Is Xal’atath actually telling the truth here? If so, we have more to worry about than the Burning Legion. We – the mortals of Azeroth – aren’t exactly doing a lot of preparing. But in the cosmic struggle between Light and Void, can we truly declare a victor? Or is that conflict an inevitability that has to exist? It’s a question that’s as-yet unanswered, but it feels like we’re going to be giving it a closer look soon.